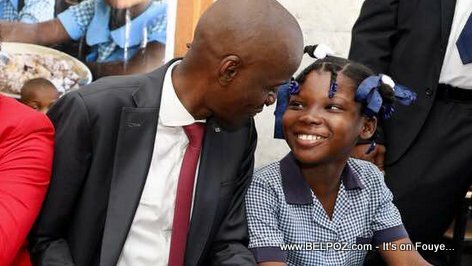 Here is a photo of Haitian president Jovenel Moise and a Haitian public school student during a school opening ceremony for the 2018-2019 academic year. 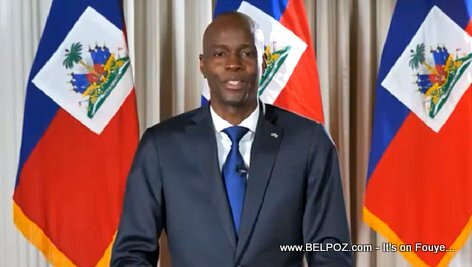 While the children were still in school last year the ministry of National Education was already preparing for this school year, president Jovenel Moise told Haitian parents. As president, I made sure to ask all institutions to make sure that all goes well during this school year. 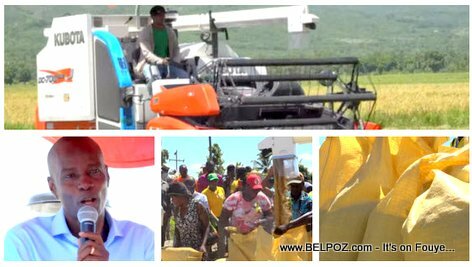 Haitian rice planters in the Artibonite region are amazed as they witness rices being bagged the new Kubota DC70 G Plus combine harvester brought into the region by President Jovenel Moise. 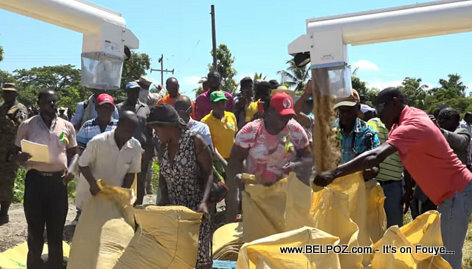 Haitian President Jovenel Moise introduces combine harvesters in the Artibonite region to improve how Haitian rice farmers harvest their rice production. Before it was done mostly by hand. now the combine harvester harvest, cleans, and bags the rice. Harvesting rice in the Artibonite valley of Haiti has been done by hand for the longest time. President Jovenel Moise is changing that with the introduction of combine harvesters to handle the rice harvest and putting rice in bags. Rice planters int he Artibonite department are grateful and they thank president Jovenel for this wonderful upgrade in the production of rice in the region. It was on Sunday August 12 2018 that president Jovenel Moise distributed a batch of materials including 2 harvesters to the planters of the locality of Cova, in the Artibonite Valley. 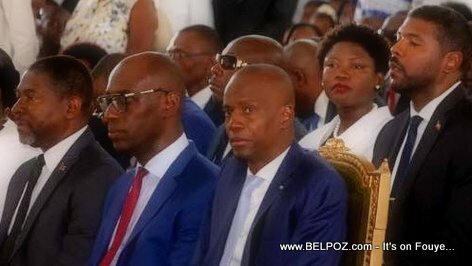 Haitian President Jovenel Moise attended the solemn mass at Cathedral Notre Dame of the Assumption of Cap-Haitien to celebrate the festival of the patron saint of the second city of the country on Wednesday, August 15, 2018. President Jovenel was accompanied by several members of his ministerial cabinet. Fête Notre-Dame is an important event in Haiti. Fête Notre-Dame is celebrated in many Haitian cities, Port-au-Prince, Cap-Haitien, Les Cayes and several other cities and localities of the country (Petit-Goâve, Ouanaminthe, Domond, Difailly, Anse-Rouge, Croix-des-Bouquets and more. 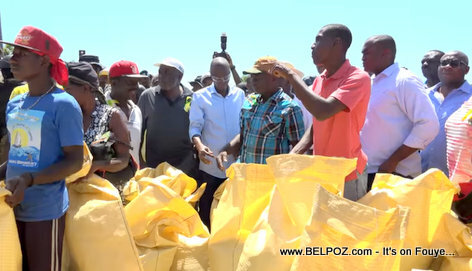 Take a look at this... Haitian President Jovenel Moise introduces combine harversers in the Artibonite region to improve how Haitian rice farmers harvest their rice production. 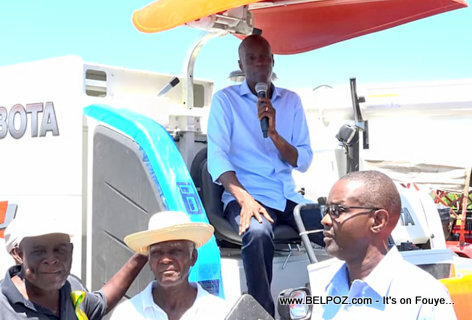 Here is a photo of Haitian president Jovenel Moise speaking to rice planters in Artibonite Haiti while sitting on a brand new Kubota combine harvester he brought to the region. President Jovenel Moise introduces combine harversers in the Artibonite region to improve how Haitian rice farmers harvest their rice production. 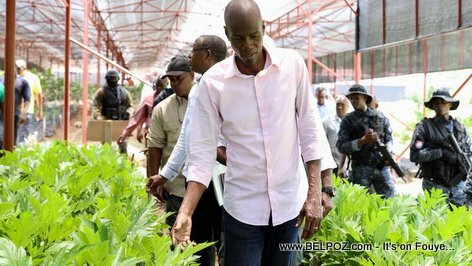 Deforestation in Haiti is a major concern for President Jovenel Moise who on Saturday August 22 2018, inaugurated his 3rd major plant nursery in the country. 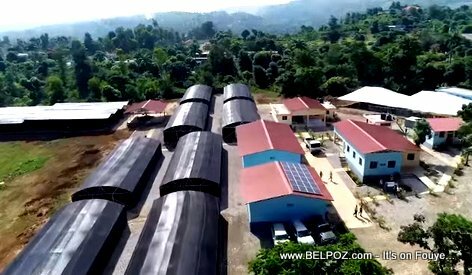 Watch this video to for more info about this new plant nursery in Haiti and what president Jovenel said on Inauguration day. The new centre de germoplasme et de propagation vegetale in Marfranc, a commune in the Jérémie Arrondissement, in the Grand'Anse department of Haiti, will be provide millions of plants each year for agriculture, forestry and conservation biology in southern Haiti. Reforestation in Haiti - President Jovenel Moise wants to make Haiti Green again! Look at all seedling (plantule in French) in a new plant nursery in Marfranc Haiti, Part of president Jovenel Moise's plan to make Haiti green again. Experts day less than 2% of the land is forested. President Jovenel Moise wants to change that. This is the third of 10 nurseries being created by President Jovenel Moise with 4.5 million trees, one in each region, to provide trees to students who will be required to plant trees as part of their school curriculum. Here is a new plant nursery in Marfranc Haiti, Part of president Jovenel Moise's plan to make Haiti green again. This is the third of 10 nurseries being created by President Jovenel M oise with 4.5 million trees, one in each region, to provide trees to students who will be required to plant trees as part of their school curriculum.